NOTE: Butcher Box sent me a box for review purposes. Some links are affiliate. All opinions are my own. MAKE SURE TO CHECK OUT MY UPDATED BUTCHER BOX REVIEW HERE! A few weeks ago, the folks at Butcher Box contacted me asking if I’d be interested in reviewing their grass-fed beef. I’m a HUGE fan of grass-fed anything, so of course I was all about it. 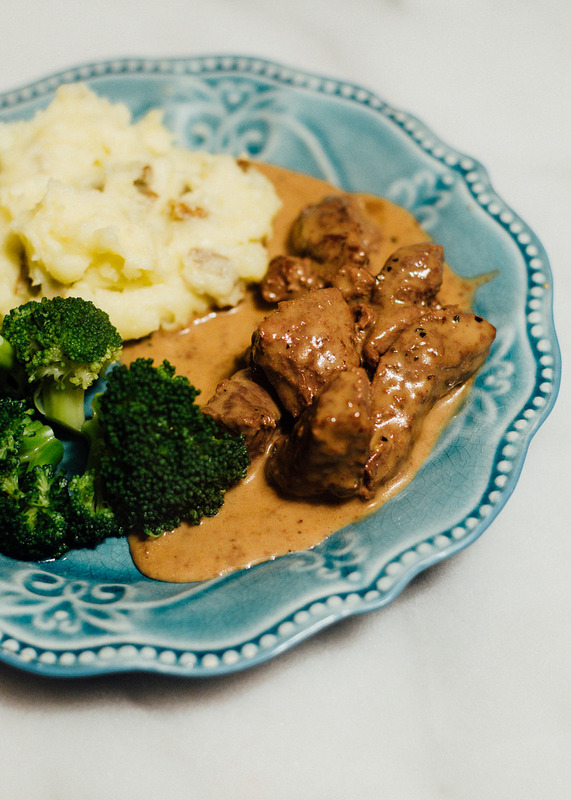 Each month, for $129, Butcher Box sends you a selection of 6-10 pounds of grass-fed beef. They also send you information and recipe cards so you can get inspiration for how to cook your meat. WHAT DO I THINK OF THE SERVICE? 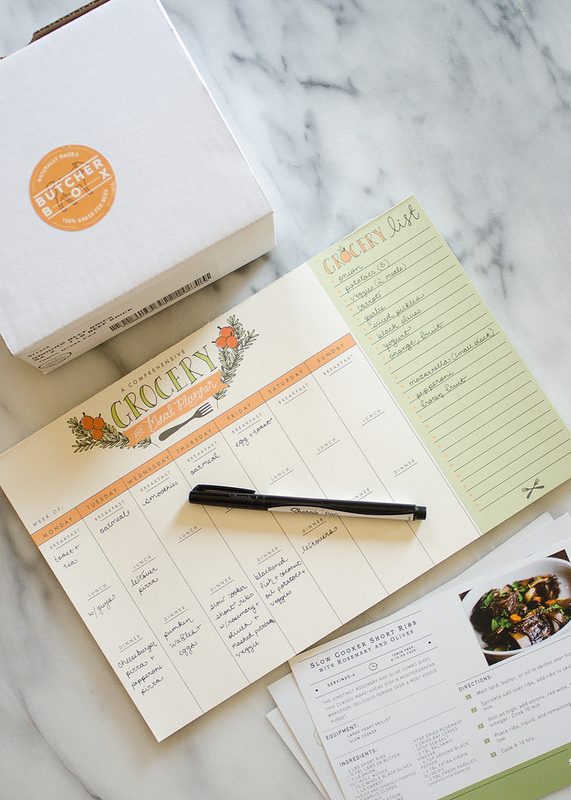 I think this is a really awesome idea for a food subscription service! Not only does it take the hassle out of shopping for grass-fed beef, it also forces you out of your comfort zone to try new cuts of meat. In my box I received: boneless short ribs, sirloin tips, sirloin steak, ground beef, and bacon. The major downside that I see to this service is the cost. If this was my only meat for the month, $129 wouldn’t be a bad price. But we like to eat other types of meat (chicken, pork, etc. ), so we need to supplement. If you’re a smaller family, I would maybe suggest purchasing a box every other month. Also, the ground beef was perhaps a bit high in fat content for the dish I used it in. 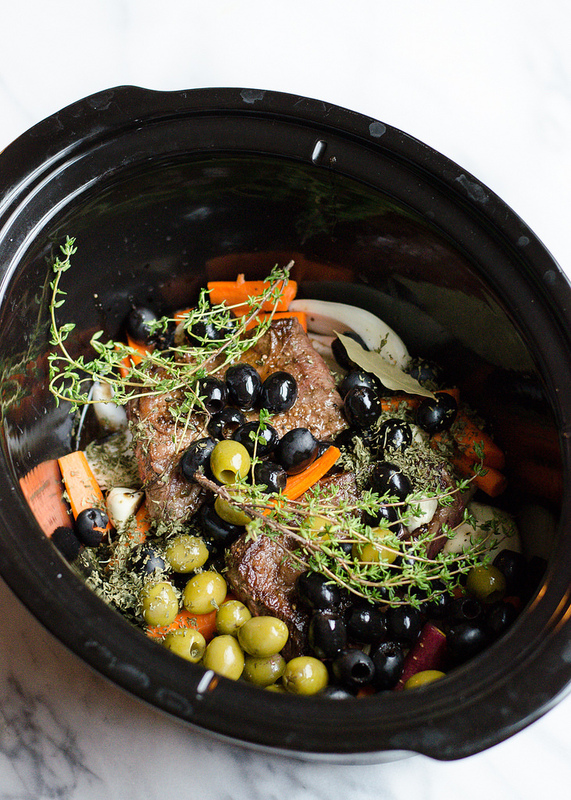 Slow cooker boneless short ribs with olives, balsamic vinegar, thyme, onions, garlic, and carrots (based off of the recipe card that came in the Butcher Box). I cooked it all day on low. That was one of the most tender, buttery roasts I’ve ever had. Mmhmm. Sirloin tips in a mushroom, balsamic, teriyaki, cream sauce. Reuben and Helen LOVED this. Which is kind of a big deal, because Helen doesn’t like meat. But she asked for several more pieces! I thought this was a sirloin roast, so I was planning on roasting it in the oven. When I took it out of the package I realized that it was already cut into pieces. So I improvised and seared the meat and added a sauce. If I would have realized sooner how the meat was cut I would have marinated it for extra flavor/tenderness. But it was still good! SO, WOULD I SUBSCRIBE TO THIS SERVICE? If my food budget was higher, I would. It’s nice to have the decision about what meat to buy taken care of. And I got to try cuts of meat that I was either too scared to try, or just didn’t think to buy. 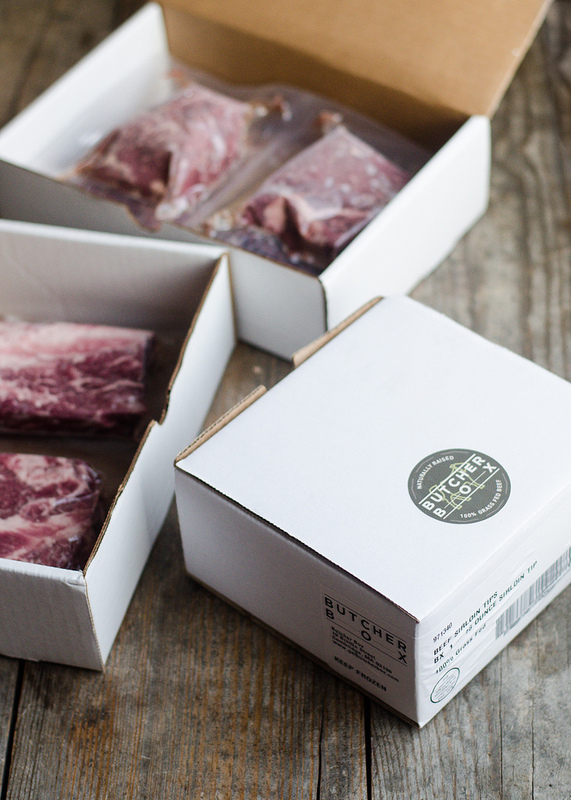 Click here to learn more about Butcher Box. What do you think of this type of service? P.S. – If you’d like to try out ButcherBox for yourself, here is a coupon code for $15 off + a FREE package of sugar-free bacon! Use the code “Buttered” at checkout. The meal planner that you're using is beautiful! Did it come with the Butcher Box as well? Are there portion sizes enough to feed a family of 4? They say about 20 meals but it doesn't say how many each meal feeds. Thanks! We buy grass-fed, grass-finished beef locally for less than $5 a pound. The catch? We have to purchase a half-side of beef (around 600 lb)! We bought a 17 cubic food freezer and put the meat (which comes frozen) in our back laundry room. It is pre-cut to our preference and labeled. So around $3000 (plus the initial freezer and cost to run it) feeds our family of 3 adults all the beef we want for well over a year. We found our local source through a farmer's market. This service costs about half that a year for a maximum of 120 lb of beef (apparently). If you don't have a freezer and a budget to make a large purchase all at once, this service could work for you. I would love to obtain your document. Can you tell me who anthro is. I do appreciate it! Could you please give me the name of the company? I've been lookimg at butcher box reviews and they all seem to read the same… generally positive and details glossed over. Yours seem one of the more down to earth ones so I'll ask you some questions no one seemed to answer. Are the packages labeled with the weight of the meat? That would help with recipes to know how much tri-tip steak was given,for example. Also, is the meat totally frozen such that you have to defrost before cooking? That would defeat the convenience factor a bit for me if so. Thanks in advance. As your one annonymous said .."generally positive and glossed over" regardng reviews. On FB Butcher Box removes any uncomplimentsry although honest reviews…Mine and another customer's were removed this morning…only the glowing left…honestly…it would be great for me since I do not eat much meat but my box arrived thawed. There is absolutely NO phone cusomer service..only email. I was sent a canned message telling me there was a 48 hour wait for customer service. 3 days later I get an erroneous email which I responded ti immediately and finally late Monday (box arrived Friday) I was sent another email full of errors saying they refunded my money and if it doesn't show up in 10 days take it up with my bank…..??? So far…no refund. Please be fair to your readers and at least tell them too google for bad reviews…there are plenty out there and all the same…thawed meat and no customer service.